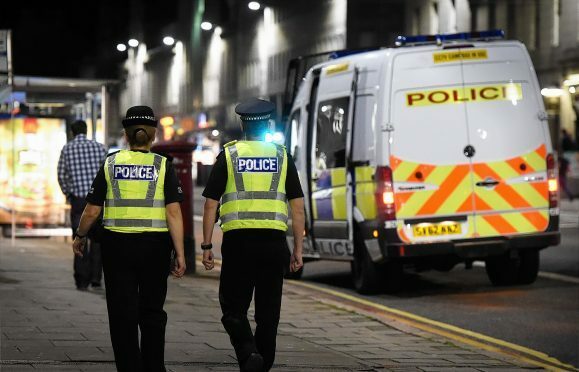 Police officers are spending increasing hours acting as “babysitters” for crowds of unruly youngsters who gather in the heart of Aberdeen. Sergeant David Cowie, revealed the force’s “frustrations” over the level of manpower required to keep watch over a rising number of young people causing trouble. The situation reached boiling point this week when a huge fracas broke out involving 30 youths, which led to three arrests, and patrols have now been ramped up. And Sgt Cowie voiced fears that the “intimidating” groups of 14 to 18-year-old troublemakers could put people off visiting the city centre for the upcoming Nuart festival. He said: “Youths have been our biggest issue and it’s becoming pretty frustrating, to be honest. “It is like we are babysitters for everybody’s children in the city centre just now. “On Tuesday night we had about 30 of them marching through the streets, which turned into a carry on and three were charged with breach of the peace offences. Sgt Cowie revealed the severity of the situation during a meeting of Aberdeen City Centre Community Council. The increase in antisocial behaviour has occurred despite the force launching an operation aimed at cracking down on the problem during the school holidays. In the weeks prior to the Easter break, officers visited several secondary schools in an effort to get children to see “the people behind the uniform” and nurture a healthier relationship between youngsters and the force. Nuart will launch next Thursday with a series of events in the centre, and walking tours taking in the city’s newest artwork are scheduled across next weekend. Sgt Cowie added: “We want people to come into the city centre and enjoy themselves, but a group of about 40 kids coming towards you can be intimidating. “They don’t understand the impact they are having on people and businesses. Torry councillor, Christian Allard, said he witnessed the chaotic scenes on Union Street on Tuesday night and praised police for how they handled it. He said: “I thought they did a fantastic job. Sgt Cowie dismissed the notion that children were acting up because there was “nothing for them to do” in Aberdeen. He added: “That is simply not true, we have fantastic schools which offer plenty of different things to do and camps all over the place.